FrontPage 2000 First Page - - PAGE 405. My First FrontPage 2000 Published Page · · PAGE 405. July 22, 2016: This is my first attempt at publishing from FrontPage 2000 after loading the program directly on my Windows 8.1 hard drive. This is not being done on my Virtual Machine running Windows XP. I finished editing existing pages last night using this program on the Virtual Machine computer. I had to delete all my web page hit counters and re-install them from FP2000 to get them to work correctly. The new hosting web server is running LINUX with FrontPage Extensions. My old FrontPage 98 program needed a Windows host server to publish. FrontPage 2000 does not have that problem. I learned all the solutions after a couple of Google searches last evening. I had FP2000 for quite a while and tried it out a few years ago. I did not feel at ease with a "combined" program of publisher and editor together. Last night I discovered how to configure the page editing screen to my satisfaction. Now I just need more practice using FP2000. I have now transferred all the web site files to my regular laptop computer hard drive and installed FP2000 on it to run in Windows XP compatibility mode. By the time I finish editing this page and publish it to the web server, I will feel that everything is running as it should. I have been reviewing many of the 800 pages of this web site and discovering some simple errors here and there. Even though this is page number 405 under my RV-9A group of web pages, you have to consider all the other sections of this web site. The 2007 trip to Alaska was 50 pages. The Oshkosh pages, Other RV builder pages, Other Travels pages, Technical Articles pages - - well you get the idea. It is Friday at lunch time as I write this page. The weekend ahead should give me time to publish my experience at the Flight 93 Memorial in Pennsylvania after my Jerrie Mock museum exhibit opening in Newark, Ohio in June. I have a number of photos taken on my short airline trip to Tucson, Arizona and Fort Huachuca for a fiber optic seminar as part of my day job. Going to southern Arizona in July is different from living in Florida. We have a "steam bath" on hot summer days, Arizona is an OVEN with dry heat. I hope to get the Arizona story published by next weekend. The story about the second half of my two-week road trip in June begins here. June 19, 2016: This was a Sunday and Father's Day here in the USA. I departed Newark, Ohio early and headed EAST on Interstate Highway 70 toward Pennsylvania. I stopped to top off the fuel tank of the rental car near Wheeling, West Virginia (lower fuel prices) and continued to the point where (I-70 joins the Pennsylvania Turnpike and Interstate 76 that heads for Harrisburg and Philadelphia. I wanted to avoid the toll road and all that traffic to see the country in this part of the state. I drove a few miles north on US 119 and followed US 30 which roughly parallels the toll road across the rest of the state all the way to New Jersey. 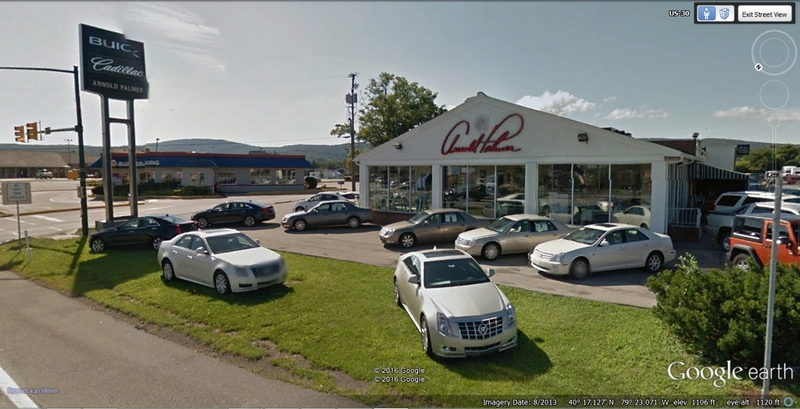 Driving 7 miles East on US 30 put me in front of the Arnold Palmer Cadillac dealership located in Latrobe, PA -- seen here from a Google Earth image. I continued on US 30 for another 32 miles of scenery until I reached the U.S. National Park Service Flight 93 Memorial site. I was surprised when I saw a small road sign indicating it was just a few miles ahead. Until I saw that small sign, I had not thought about the location of Shanksville or the Flight 93 crash site. Up until then, this was just a Sunday drive to see an old US highway I had never traveled before. Now, my visit to the memorial site has been posted on my page about Flight 93. Click on that link to see my photos taken during the visit. Here is my route on my old Street Atlas 9 map program. The blue line is my GPS track following US 30. My visit to the Flight 93 Memorial took me past lunch time. I got back on US 30 and found a McDonalds a few miles East of Bedford, PA. A pair of their fish sandwiches for five bucks hit the spot. I arrived at my son's house in York, Pennsylvania in time for dinner and had a chance to spend some time with my grand daughters by the pool. That story is now in my family section of this web site. June 20, 2016: This Monday morning found me heading from York, PA to Annville, PA just East of Hershey, PA. I had a morning meeting there to provide additional product training. After lunch, I went to their office in Chambersburg, PA on the other side of Harrisburg. Monday evening found me in a motel in Leesburg, Virginia for a morning meeting with another distributor. June 21, 2016: Tuesday started in Sterling, VA with a two-hour meeting at Graybar Electric. A new sales guy was eager to learn about RF over single-mode fiber. Teaching that stuff is what I do for my day job. After lunch some heavy rain came to the DC metro area. I was creeping along on the I-495 beltway north of Washington, D.C. due to the bad weather. I got off on US 29 to get out of the heavy traffic. I cut across to US 1 and reached my motel just as the rain was ending. The rental car I brought up from Florida was loaded with my demo products and a couple of pieces of test equipment. The tire pressure monitor gave me some warnings in the rain. I needed to get fuel and as I did it started to rain again. I had taken along my big umbrella and this was when I needed it. The air pump was not on the fuel island under cover. I pulled the car over to the air pump and stretched out the hose so as not to waste any time after I put in the money to start the pump. I had my air gauge in my pocket and found a way to keep the umbrella above me to fix the low air pressure. June 22, 2016: Wednesday had a morning meeting in Columbia, Maryland with a major A/V contractor that does work in stadiums and arenas. I picked up a Subway foot-long sandwich for lunch and ate half of it in the restaurant. I went around Baltimore on the 695 beltway on the west and north side of the city, then took US 1 up into Pennsylvania. I had a late afternoon meeting with another customer in West Chester, PA before heading for my hotel in Horsham, PA north of Philadelphia. There was no rain this day. June 23, 2016: Thursday morning was spent with my largest stocking distributor, meeting a new inside sales person, and the other staff I work with on the phone on a regular basis. As always, I brought the donuts for the office. The other half of my sub was my lunch today. I always have an insulated "cooler" bag with frozen water bottles to keep some things fresh, like half a sandwich, and a chocolate bar or cupcakes from Little Debbie. I got out of Philly before the afternoon rush hour and stopped for fuel in New Castle, Delaware. I was able to confirm a Friday morning appointment for 8:30 AM in Raleigh, North Carolina. My cable provider had a secure outdoor Wi-Fi link I could use at the Delaware fuel stop. I logged on and reserved my hotel room for Thursday evening in Raleigh. I took US 301 south from Delaware and crossed the Chesapeake Bay Bridge going westbound with US 50. I stopped in Maryland for a light meal at 6 PM before crossing the US 301 toll bridge across the Potomac River into Virginia. This route avoids the DC beltway and I-95 traffic jam in Northern Virginia which can last for 30 miles or more late in the day heading for Richmond. When I came to I-95 north of Richmond, a truck stop there had unleaded fuel for $1.99 per gallon. That was the lowest price I paid on the entire two-week road trip. I checked into my hotel in Raleigh before midnight. June 24, 2016: The last day of customer meetings started with a short meeting at 8:30 AM in Raleigh. Lunch was in Lexington, NC and I had an afternoon meeting north of Charlotte before pointing the rental car south toward Florida at 3:15 PM. I filled the fuel tank in Rock Hill, SC as their $1.99 fuel prices are lower than in North Carolina. I always plan my fuel stops to avoid North Carolina gas prices. I stopped in Walterboro, SC to get another five gallons of fuel insuring I would not need to stop for fuel in Georgia or Florida on the way home. I got some fast food before I got back on Interstate 95 and headed for Georgia. Two rest stops would get me home at mid-night ending a road trip of 3,723 miles across 12 different states. And of course, I crossed part of Georgia again and Florida on the I-95 corridor Friday evening. June 25, 2016: Back at home, I cleaned out the rental car Saturday morning and returned it to Avis full of gas by lunch time. I turned my attention toward the next trip to begin on Wednesday, July 6 to Arizona for a fiber optic seminar at Fort Huachuca (July 7) and a Graybar Electric sales meeting in Tucson (July 8). At least I get some down time with a long weekend for the Fourth of July. July 26, 2016: Sunday and some time to update the web site. I have noticed how much faster pages publish now that I am running FP2000 on Windows 8.1 with no virtual machine to slow things down. Part of that speed is probably due to the way FP2000 keeps track of the files on the server and the changes to files I make or add to this hard drive. Either way, the time to publish files is much faster now. I went to see Star Trek Beyond in 3D at the 4 PM showing today and I was glad to see many references to the original history of Star Trek as well as the "new time line" after Vulcan was destroyed in the first new installment of Star Trek movies from J. J. Abrams. I was amazed at the low number of people in the theater today. I realized as I looked around and spoke to a few of them before the local advertising started, they were about my age, not the younger generations. I asked the lady sitting two seats to my left if she watched the original shows in the fall of 1966 on NBC. She confirmed she did, just as I did as a college kid at age 19 -- 50 years ago. Enough about today, I have to publish my visit with my grand daughters in my Family pages (9:15 PM). The elapsed time to publish this updated page to the host server was about 20 seconds. Family pages are now updated and published at 10:47 PM. I read all the older pages from Pennsylvania visits and corrected some errors. My next web publishing session should post the Arizona photos under the "Other Travels Menu" page. See you next time (Edward). August 1, 2016: I spent the weekend finishing up the Google Earth scenery files for Jerrie Mock's trip around the world. That file and a GPS file, both in KMZ format are ready to download for each of you to share her 1964 adventure. The scenery file is full of "push pin" notes that appear on the Google Earth screen as you "fly" her routes. A few new messages and pins were added on the approach and landing in Columbus at the end of her 29-day journey around the world. The web publishing of the trip to Arizona is finished with three new pages accessible via my "Other Travels Menu" page. One page in that posting is about Jerrie Mock and her layover at the Tucson Airport motel for some rest on the last night before she made it home to Columbus, Ohio. I never cease being amazed at some of the typo errors I make when creating these pages. I just noticed a date above that was wrong and has now been corrected. If you see something, say something to me if any of these pages need a correction. August 13, 2016: I got out my airplane and ran the engine for the first time since my flight of March 5, 2016. I started the airplane engine and taxied up to 40 MPH on the runway in one direction, then back to the other end before putting the airplane back in the hangar. The nickel-carbide cylinders are not in danger of rusting. The fuel in the carburetor had evaporated and required the electric fuel pump before starting the engine. The fact that it did not start immediately allowed the low RPM from the starter to get the oil circulating a bit before the engine came to life. I used the engine primer to get things going. Everything works. The battery minder continues to keep the battery healthy. September 4, 2016: Here is the latest news about my pilot activities. In the past month, I have completed the FAA requested stress test with supporting information. All of that documentation was sent to the FAA medical branch on August 24, and delivered on August 26. I called this past Friday, September 2nd to confirm the documents are being processed, and discovered they have not yet been logged into the system during the seven days since they were delivered. I will call back next week to check again. September 7, 2016: I spent some time over Labor Day weekend creating new Google Earth GPS tour files for my trip to Denver in 2006. I could not find the actual GPS files for the return flight segments from Denver to Folks Field and had to improvise. I still have the Street Atlas map file I used to create the flight path map seen here. The RED line is the westbound flight avoiding some weather in western Tennessee. The GREEN line shown below shows the actual return flight segments GPS files that I imported into Street Atlas USA version 9 right after my 2006 flights. I used my GPS creative skills from the Jerrie Mock project with good success for this new Google Earth tour project. 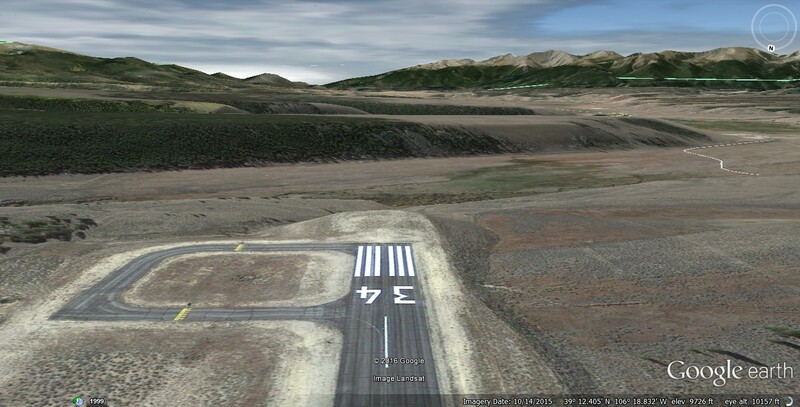 CLICK HERE to download the Denver flight Google Earth KMZ file. You can read my web pages and see my photos and video screen captures from that 2006 trip to Denver beginning on PAGE 213. You can now travel the flight routes from the 2006 Denver trip by using Google Earth. I have put in plenty of push-pin notes along the way. I was able to show the sun setting over Lookout Mountain as I was arriving back home at Folks Field that last day. The other short Google Earth tour project I created is a flight from the highest airport in the USA located near Leadville, Colorado. 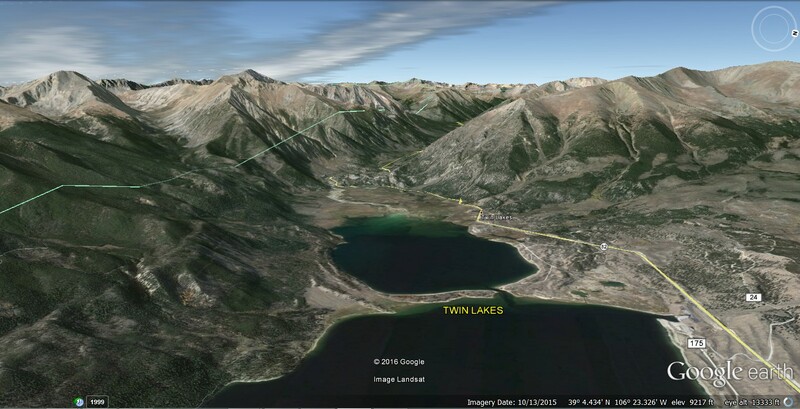 It is a short flight down the valley to an area known as Twin Lakes where state route 82 heads west from US 24. That is the route I created to fly across a mountain pass into the valley where Aspen and Glenwood Springs are both located. Download the Google Earth tour file with THIS LINK. Here is the view after takeoff from the Leadville Airport. The Google Earth image below is dated October 14, 2015. It clearly shows the "tree line" on the west side of this valley. It is the absence of trees above that line that gives the Rocky Mountains their name. The south end of the runway is 9,924 feet MSL according to FAA records. You can see Google Earth missed that elevation value by about 200 feet. Here is a view of the Twin Lakes area looking west and following route 82 toward the mountain pass ahead in these mountains.. 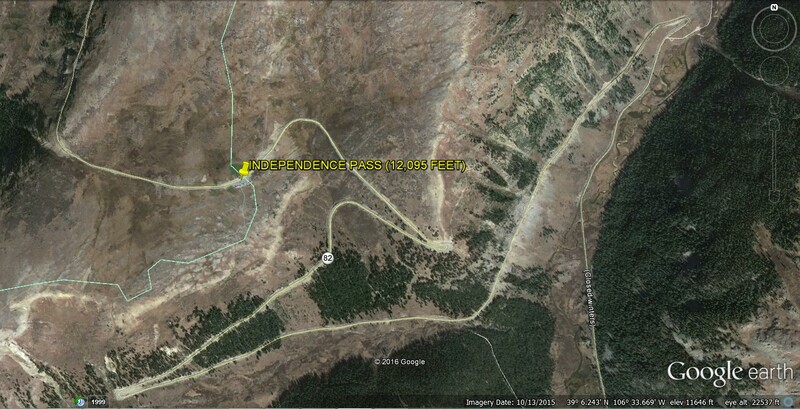 This "in flight" image shows Independence Pass with Colorado state route 82 crossing the pass at 12,095 feet above sea level. You can learn more about this place via this Wikipedia article. I have a couple more images down this page to add more perspective. Here are two views looking down on the pass oriented with NORTH up in the image. The first one shows the road winding its way up the Eastern slope of the mountain. This road is closed during the winter. 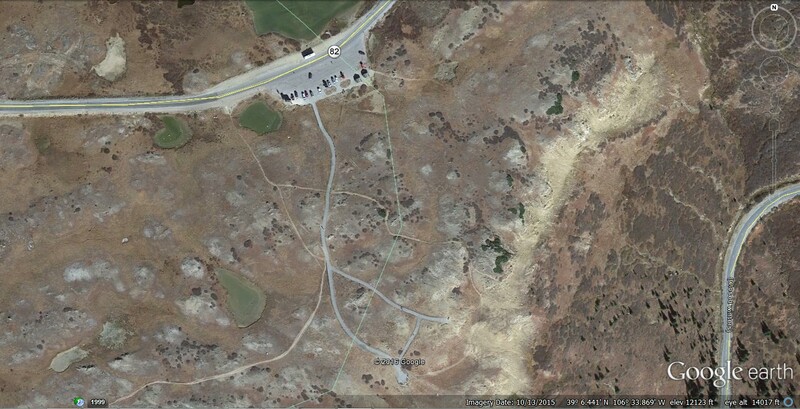 This closer view shows the trails from the parking area to scenic overlook areas. This would be the view from an airplane flying at 14,000 feet MSL. 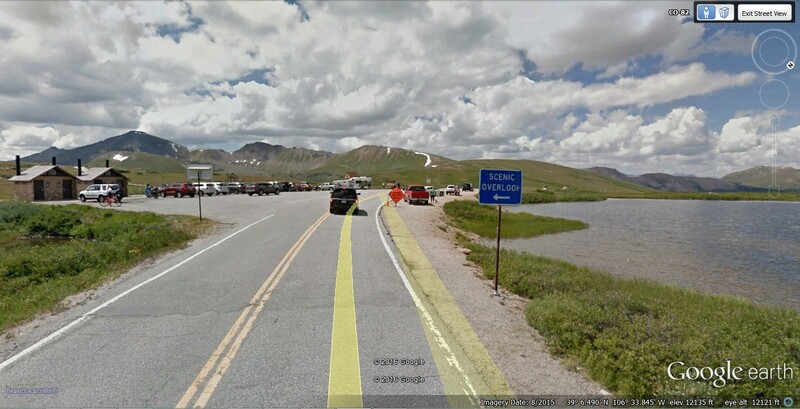 And of course, Google Earth drove one of their camera cars across Independence Pass. You can see any view you like as it passed this way in August 2015. You can also drive on any road the Google Earth camera cars have recorded with images like this one available using Google Earth. 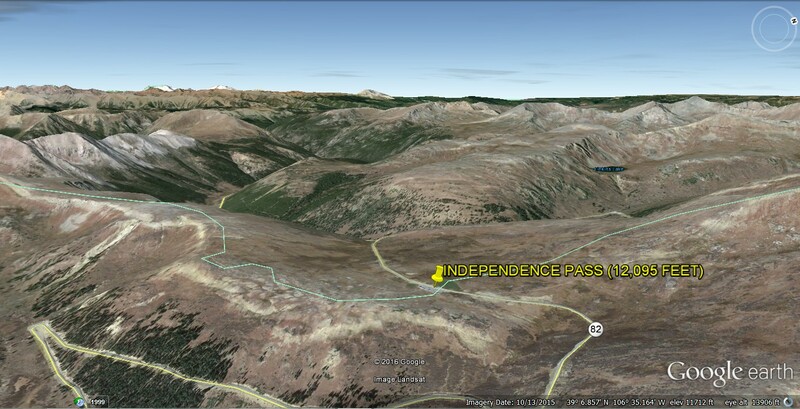 Here is the virtual flight GPS overlay using a Street Atlas USA version 9 map depicted by the BLUE line.. North is up with the departure from the Leadville, Colorado airport on the right side of the image. The landing at Glenwood Springs Airport is near the upper left of the image near the small town of Cardiff. Today I was on the phone with a customer who was a private pilot a number of years ago. We were reviewing my Technical Articles Section of this web site as part of my day job. At the end of the call, the issue of flying came up when I mentioned using my airplane for business and pleasure. Of course, the 2006 flight to Denver above was part of the discussion. He was excited to see the main part of this web site about my airplane. I am sure I will be hearing more from him very soon via email as he discovers more of this web site. September 10, 2016: I went to the airport today to clean the dust and a few bugs off my airplane from my last flight on March 5, 2016. I returned home after picking up a prescription for my wife, and a few groceries. September 11, 2016: A day that we all remember. I watched the NBC Sunday morning television show "Meet the Press" all about this day of remembrance and the effect it has on the political landscape as it exists 15 years after ALL Americans came together in response to the attack that day. Now, for some little known information that even I had to examine about my 2006 flights to Denver and back home. I have already mentioned that I could not find my GPS files from my return from Denver. When I realized I could export the GPS coordinates from my old Street Atlas map program, I was able to match up the original photo below with the correct hangar location at the Boone County Airport in Harrison, Arkansas. As a result of that new information, I have updated the GPS ground tracks arriving and departing that airport for my 2006 Denver flight you can experience using the Google Earth tour file on this web site. The updated file can be downloaded using THIS LINK. I have been thinking about other flights I can create for Google Earth that cannot be done in the real world. Flying down inside the Grand Canyon has crossed my mind. Flying UNDER the Golden Gate Bridge is another. Flying the Columbia River Gorge is possible in the real world, but how many of us will get the chance to do it in our airplanes? These ideas can be converted into Google Earth tours for everyone to experience. If anyone out there is a pilot with some saved GPS files from some of their amazing flights would like to share them, we could certainly put the on this web site, or any web site, for all to share. Don't bother sending your aerobatic flights as the loops and rolls don't translate directly into Google Earth when the GPS files are loaded. I have been reading how to change camera angles in Keyhole markup language (KML) coding and it can be daunting for anyone not a dedicated programmer. September 13, 2016: I have been working on my old Cadillac which has been leaking water into the back floor board on the driver's side. I used my shop vacuum to get it out and have been leaving the windows down to air our the car the past few days. We are getting rain today for the first time in over a week. I will find out if the problem persists when the weather clears up here in the Melbourne area.